I am calling for an allout war! I am a man of peace that is prepared to join this particular battle…. not against people, not against any particular nation, but against poverty! I am calling on nations to stop shipping bombs to Israel, but rather ship ways to end this crisis we are facing. In this day and age there is no excuse whatsoever for a child to go to bed hungry, but it was just revealed that every second child in Jerusalem is defined as poor, as opposed to every third child in the rest of the country. This in a country that has had financial contributions flowing in from all over the world for decades… this in a country where obviously more money is spent on building walls and purchasing weapons. Perhaps it’s time for AIPAC and the rest of the Lobby to get off their high horses and begin the fight against the real anti-Semitism–Poverty! The following report from Ynet just might be an eyeopener for the ‘friends of Israel’…. A new study conducted by the Hebrew University in Jerusalem’s Dr. Johnny Gal and Tel Aviv University’s Idit Weiss for the Institute for Jerusalem Studies revealed that in the past six years, the poverty levels in Jerusalem have increased by 40 percent. 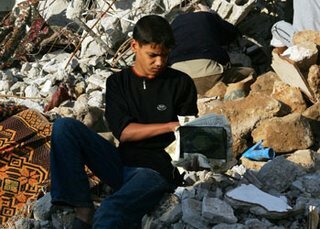 The study further showed that amongst the ultra-Orthodox and Arab populations, the poverty rate has reached 70 percent. In 1999, the rate of poor families in Jerusalem came to 26 percent whereas about two years ago the rate had risen to 33 percent. Every second child in Jerusalem is defined as poor, as opposed to every third child in the rest of the country. Only 44 percent of Jerusalem’s residents who are capable of joining the workforce are employed, as opposed to 54 percent in the rest of Israel. Those who are employed in Jerusalem also make less money. Last year, the average salary in Jerusalem was NIS 5,940 (about USD 1,400) as opposed to 7,287 (about USD 1,700) in Tel Aviv. 24 percent of the employed workers in Jerusalem have been earning up to minimum wage. The study’s composers recommended a city council be established for the struggle against poverty, and personal welfare services be given to each poor family. The study will be presented on Thursday during a seminar which will be held in Jerusalem. 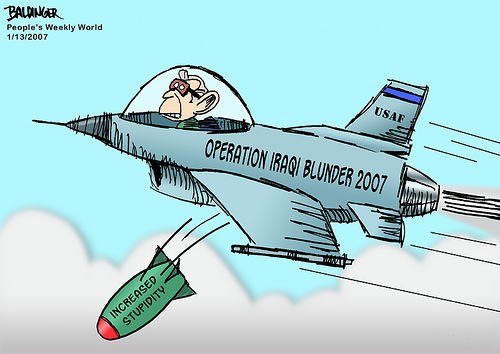 21,500 more troops to Iraq?? Over 3000 are already dead, Sadaam has been killed,when does a pullout begin? The man has proven to be totally incompetent of running his country, needless to say the Armed Forces. The cartoon at the left says it all…. 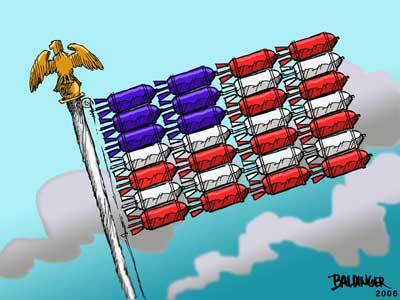 thank you David Baldinger. 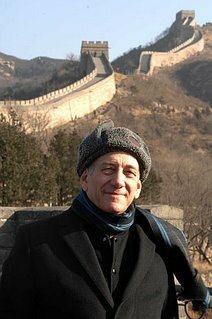 Olmert, feeling very much at home standing in front of the Great wall of China, met with high ranking government officials there today. Seems he is on a mission for his Uncle Sam to seek support in the ‘Lets stop Iran campaign’…. Don’t get me wrong folks… I am all for peace… BUT…. is this man who has become an international war criminal in his short tenure as Israel’s Prime Minister the man for the job?… The job of seeking peace in the Middle East? 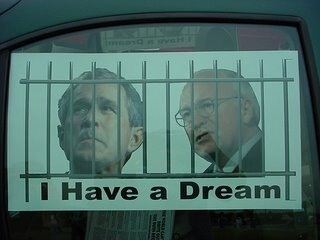 Is George Bush, the man that is already responsible for the deaths of over 3000 of his own men in Iraq the man for that job? Something just doesn’t fit here…. two of the biggest warmongers in the world seeking peace….. just a few thoughts I wanted to throw out before you read the following report from the Associated Press…..
China and Israel discussed Iran’s nuclear program on Wednesday during a visit by Prime Minister Ehud Olmert aimed at forging closer ties between the two countries. Olmert met with his Chinese counterpart, Wen Jiabao, at the Great Hall of the People, the seat of China’s legislature, during his three-day visit. Wen reiterated China’s support for UN-imposed sanctions on Teheran for its refusal to suspend uranium enrichment, saying they “showed the international concern over the Iran nuclear issue,” according to a report on Chinese state television. Before the meeting, an Israeli official traveling with Olmert said the prime minister would bring up Israel’s concerns over the consequences of Iran becoming a nuclear state. “It will be high on the agenda,” said the official who spoke on condition of anonymity. Aides said Olmert and Wen signed three agreements at the meeting. The first was a cultural agreement from 2007 to 2010. The second was on protocol requirements for the export of citrus fruit from Israel to China, and the third was a memorandum of understanding on water power between the Beijing city government and the Israeli Ministry of Trade, Industry and Labor. No details on the agreements were released. Olmert is scheduled to meet Chinese President Hu Jintao on Thursday. China, a permanent member of the UN Security Council, has strong trade ties with Iran and has been leery about imposing punitive measures, but it supported the UN resolution that orders all countries to stop supplying Iran with materials and technology that could contribute to its nuclear and missile programs. It also froze Iranian assets of 10 key companies and 12 individuals related to those programs. The council has warned that it will adopt further nonmilitary sanctions if Iran continues to refuse to suspend uranium enrichment, a process that produces the material for either nuclear reactors or bombs. Israel’s worries that Iran is its most serious threat have been fueled by Iranian President Mahmoud Ahmadinejad’s repeated calls to wipe the Jewish state off the map. Olmert has not ruled out a military strike against Teheran’s nuclear program, but has said he hopes other ways can be found to keep Iran from becoming a nuclear power. Olmert’s trip also marks the 15-year anniversary of the establishment of diplomatic relations between Israel and China, whose good relations have been marred by occasional political and trade tensions. China is now Israel’s third-largest trading partner, following the United States and Germany. A YEAR WITHOUT SHARON~~ WHAT WOULD HE HAVE DONE? I can honestly answer that in very few words, people on both sides of the wall are still suffering from the damage he did…. I wouldn’t want to see what else he ‘had up his sleeve’. JERUSALEM, Jan 3 (Reuters) – What would Arik have done? That’s what many Israelis have been asking since Prime Minister Ariel Sharon suffered a stroke and fell into a coma a year ago and Ehud Olmert, untried as a national leader, took over from the white-haired former general. The question has come up often during a turbulent year that has seen Hamas, an Islamist group dedicated to Israel’s destruction, win a Palestinian election and the Israeli military fight an inconclusive war against Lebanon’s Hezbollah gunmen. Such events have tested Olmert’s leadership and along with a series of scandals have sent the veteran politician’s popularity plummeting in opinion polls. Conventional wisdom in Israel has it that the man called Arik, whose own military and political adventures stirred controversy for decades in the Jewish state and far beyond, would have learned from experience and avoided trouble. “The bottom line: Sharon would not have gone to a war he could not win,” said Raanan Gissin, a former senior aide and now a fellow at the Institute for Policy and Strategy at the Interdisciplinary Center in Herzliya, near Tel Aviv. Israelis will never know for sure: Sharon, who suffered his brain haemorrhage last Jan. 4, is still comatose in a long-term care facility. Doctors do not expect the 78-year-old to recover. “A year after the stroke, there is something unquestionably pathetic about wondering what might have been, if Sharon were still vital, still prime minister, still with us,” commentator Bradley Burston wrote on the Web site of the Haaretz newspaper. A government-appointed commission is looking into the way Olmert, his defence minister Amir Peretz — a former trade union leader with no top-level military experience — and the armed forces handled the conflict. One million Israelis spent a month in bomb shelters under Hezbollah rocket barrages that the army failed to halt despite inflicting huge destruction in Lebanon that deepened enmity towards Israel in the Arab world. 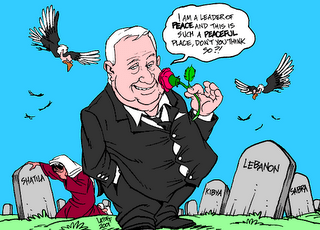 Peacemaking with the Palestinians remains stalled under Olmert — no change from Sharon’s day. But Burston questions whether Sharon, a savvy political strategist who won two terms as prime minister, might have persuaded Palestinian President Mahmoud Abbas to postpone last January’s election in which Hamas came to power. Hamas’s defeat of the moderate Abbas’s long-dominant Fatah faction clouded hopes for a revival of peace efforts after Sharon pulled Israeli troops and settlers out of the Gaza Strip in 2005 in a move that won wide public support. Meanwhile, a popular joke has been making the rounds among Israelis as they await the findings of the Lebanon war inquiry and investigations into an Olmert real estate deal, his role in the sale of a bank and appointments to a business authority. Sharon wakes up from his coma and is told he is no longer prime minister. “So who replaced me?” he asks. “That old man is still alive?” Sharon asks. “No, not Shimon Peres. Peretz. Amir Peretz,” Sharon is told. It was a turbulant year. It was a year of violence, of destruction, of death. Take 3 1/2 minutes of your time to watch THIS video prepared by the Electronic Intifada. Then take the next 365 days working to make sure the next year is a better one… for the entire world. Now watch THIS to see how possible it is…. A few months ago I wrote a tribute to my Yiddish teacher of many years, Itche Goldberg. Itche was a great man, an example to all who knew and loved him. This morning I was saddened to find an obituary of him in the New York Times. At the age of 102, it should not be shocking news, but very sad nonetheless. I want to offer my friend David, his son, my deepest condolences, his daughter Susan and his widow Jenny. May they be comforted knowing that their husband and father will be mourned by the thousands whose lives were touched by him. Rest in Peace Itche, in a world at peace. Itche Goldberg, a champion of Yiddish who wrote and edited and taught his beloved language in the face of all those who said keeping Yiddish alive was a lost cause, died last Wednesday at his home in Manhattan. He was 102. He died of complications of cancer, his son, David, said. Passing on the Yiddish tradition to future generations was the passion of Itche Goldberg’s life. He promoted the language in every conceivable form: writing poetry, librettos, children’s books and essays and running Yiddish schools and summer camps. His book “Yiddish Stories for Young People” is still used in the shrinking network of secular Yiddish schools. Mr. Goldberg’s final collection of essays in Yiddish, “Essayen Tsvey” (“Essays Two”), was published in 2004 on his 100th birthday. In secular Yiddish circles, Mr. Goldberg is best known as the editor of one of the longest-running journals of Yiddish literature, Yidishe Kultur. He served as editor from 1964 to 2004, when he published the journal’s final issue. Mr. Goldberg was a veteran of the heated ideological wars of the 20th century over Judaism, Yiddish, socialism and communism. He quit a job at a Yiddish summer camp in Canada in the 1920s after a fight with the anarchist Emma Goldman over the Sacco and Vanzetti case. And he was no fan of the writer Isaac Bashevis Singer, who won the Nobel Prize in literature in 1978. He published an essay criticizing Singer as failing to reflect the humanist and social ideals that Mr. Goldberg felt were the central themes of Yiddish culture. He never stopped championing Yiddish, in whatever form, even in the face of evidence that fewer and fewer people were interested in it. Yiddish is a Germanic language that developed as the lingua franca of the Ashkenazic Jewry by incorporating Hebrew and borrowing liberally from the different European lands where Jews lived. The use of Yiddish has greatly diminished, with the notable exception of its use among Hasidic Jews who continue to speak the language of the European Jewish communities from which they sprang. Mr. Goldberg was decidedly secular. But as he told an interviewer not long ago, “Just because I’m secular doesn’t mean I’m antireligious.” What was important about Judaism, he said, was its progressive values and not its religious rituals. He pushed for more Jewish content in the Yiddish schools of his day, including more study of the Bible and of Jewish holidays, to the dismay of some of his anti-religious colleagues. 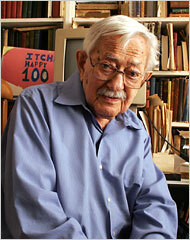 Isaac Goldberg was born in Apt, Poland, on March 22, 1904. From early childhood everyone called him Itche, a diminutive form of Isaac. In 1920 he moved to Toronto, where he taught Yiddish at the Workmen’s Circle/Arbeter Ring School, which promoted a socialist ideology. Later, when he moved to New York, he broke with Workmen’s Circle and embraced communism, seeing the Soviet Union as the salvation for Jewish national and social problems. He became the cultural and national school director of the Jewish People’s Fraternal Order, a branch of the pro-Communist International Workers Order. Mr. Goldberg repudiated Communist ideology in the 1950s when the Stalinist regime’s horrors became apparent, particularly the execution of Jewish writers in 1952. Although he was threatened with deportation because of his Communist activities, Mr. Goldberg was able to remain in the United States, and eventually became an American citizen. From 1970 to 1985, he was a professor of Yiddish language and literature at Queens College. Two years ago, in honor of his 100th birthday, a group of Jewish musicians performed an adaptation of I. L. Peretz’s “Oyb Nit Nokh Hekher” (“If Not Even Higher”), with a libretto by Mr. Goldberg. It was one of more than 20 works that he wrote with the composer Moyshe Rauch. In addition to his son, who lives in Manhattan, Mr. Goldberg is survived by his wife of 67 years, the former Jennie Wilensky, who is 101; a daughter, Susan, of Manhattan; two granddaughters; and two great-grandchildren. Mr. Goldberg fought to keep his magazine Yidishe Kultur alive right to the end of his life. Israel seems to have the attitude that if you ignore an issue long enough, it goes away. This does not work with reality, nor with real people…. the issues are here, the people are suffering. One such issue, and a key one, is Family Reunification. 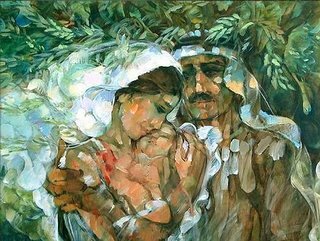 It is illegal for a Palestnian living in Israel Proper (an Israeli Arab) to live with his/her spouse who lives in the Occupied Terrirories… together in in Israel. The freedom of love and marriage is one of the basic human rights. Its denial to 1.4 million Israeli citizens, solely because they are Arab, is a severe violation of the international Bill of Rights that has been signed by Israel. It also attacks the roots of Israeli democracy. Why?? To keep terrorists out? To protect the families involved from potential danger? Or just like everything else…. because they can! Read THIS esaay by Uri Avnery appearing in today’s CounterPunch. As always, a brilliant read. Did anyone ever stop to think what life is like in prison for a man pending sentence, yet knowing what that sentence will be. A man caged up like an animal, yet refusing to be treated as one. What did he do those days, what did he dream? Say what you like about Saddam Hussein, but no one can say he wasn’t a proud man. I have lots to say about him, mostly negative, there is no point in saying any of it, he’s gone…. history.. but the question still remains, what were his last years like? The following Guardian report is based on an interview with Saddam’s personal nurse, it shows a surprisingly human side to a man that has been painted so inhuman by his captors…. Master Sergeant Robert Ellis told an American newspaper he had checked Saddam’s health twice a day, with orders to do whatever was needed to keep him alive. “That was my job: to keep him alive and healthy, so they could kill him at a later date,” he said in an interview with the St Louis Post-Dispatch published on Sunday. For security reasons, the ex-president was never referred to in jail by his real name, but his codename – “Victor”. He slept in a 1.8 metre by 2.4 metre (6ft by 8ft) cell with a small table, two plastic chairs, a prayer mat, two washbasins and some books, including the Qur’an. He did not complain much, Mr Ellis said – “he had very good coping skills” – and if he did complain it was usually a reasonable grievance. At one point he went on hunger strike because the guards were sliding food to him though a slot in the door but he started eating again when they delivered it to him in person. “He refused to be fed like a lion,” Sgt Ellis said. When he was allowed short visits outdoors, Saddam would feed birds with bread saved from his meals and water a patch of weeds. “He said he was a farmer when he was young and he never forgot where he came from,” Sgt Ellis said. He also read poetry to the nurse and recalled telling bedtime stories to his children. He appeared to have no regrets about the way he had ruled Iraq. “He said everything he did was for Iraq. One day when I went to see him, he asked why we invaded. Well, he made gestures like shooting a machine gun and asked why soldiers came and shot up the place. He said the laws in Iraq were fair and the weapons inspectors didn’t find anything. Protests over Saddam’s hanging continued in parts of the Middle East yesterday, with his eldest daughter, Raghad, making a brief public appearance in the Jordanian capital, Amman, where hundreds of demonstrators had gathered. ‘How many deaths will it take till he knows that too many people have died?’ Is 3000 not enough? One would have been too many! The image of Mary holding Her dead Son comes to mind with each report of an American casualty… a mother holding her dead son… a son killed by hate, by ignorance, by government decree… yes, government decree! Bush sent these troops into Iraq, Bush can pull them out NOW…. while they are still alive, not one by one in a flag draped coffin. The people of Iraq must determine their own future, not Washington… there has been enough death and suffering. BRING THE TROOPS HOME NOW! Below is a beautiful piece by the Associated press…. you gotta love these Grannies! NEW YORK — A group of anti-war grandmothers gathered Monday to call attention to the growing loss of lives in Iraq by reading the names of the dead _ a day after the American death toll in Iraq reached 3,000. About 60 people from the group Grandmothers Against the War and their supporters read the names of the war dead from New York, New Jersey and Connecticut in Manhattan’s Rockefeller Center as curious tourists took their photos. The vigil was one of more than 290 events planned in 46 U.S. cities, according to the American Friends Service Committee, a Quaker-led social justice group. In New York, a group of counter-protesters said the grandmothers were insulting U.S. troops, who need support during the Iraq war. The granny group later walked to the military recruiting center in Times Square. Meanwhile, President Bush said the nation is mindful of the troops’ dedication and sacrifice. “In the New Year, we will remain on the offensive against the enemies of freedom, advance the security of our country and work toward a free and unified Iraq,” he said in a statement released from his ranch in Crawford, Texas. By Monday, the American death toll in Iraq had climbed to 3,002, according to a tally of U.S. military deaths compiled by The Associated Press since the war began in March 2003.